Even though we know the personality of most cats can be demanding, aloof and more than a bit “me-centric,” we still want to feel, at least on some level, that our beloved kitty actually does view us as more than a feeding-machine. However, winning the affections of a feline is not always the easiest task on the planet. In fact, with some cats, you are going to work for it! If you’re in the battle of Love-Me-Kitty, then you’ve got to check out these 21 ways to make your cat love you. One of the biggest mistakes pet parents can make when it comes to cats is treating them like dogs. Historically, dogs were domesticated to work alongside its human and are by nature very social creatures. Cats, on the other paw, are solitary and worked out a symbiotic relationship with humans by keeping the vermin population under control. With this in mind the key is to strike a healthy balance with your cat. Give your kitty space when she needs it and don’t be offended if she chooses a sun patch over your lap for her afternoon nap. Nature and nurture play a huge role in most cat’s attitudes. There are some breeds that are by nature more anti-social; however, the way a cat was treated early on in its life will certainly shape its personality. For example if a cat was abused, mistreated or neglected as a kitten, this lack of nurture can make it fearful and mistrusting of humans. If you have one of these cats, meet him where he is, understand he’s not against you, just scared of the unknown. Patience is the key to earning this fella’s affections. In addition, be aware of the needs of the senior cat. Sometimes with old age our cats can experience aches and pains and eyesight and hearing loss that we may not always be aware of. Give the later-in-years cat the comfortable atmosphere it craves and be sure to know and respect its limitations. When speaking to your cat try to keep your tone calm and non-threatening. Most cats don’t understand a huge vocabulary, so your voice and body language is all it is reading your intentions by. Yelling at your pet will only create an atmosphere of stress, fear and mistrust, so keep those tones friendly and the conveyed messages ones of kindness and love. In addition, never stare directly into a cat’s eyes for a long period-of-time, as this can be misinterpreted as an aggressive action. Cats love to be cozied in with quiet areas to get away from it all. This is especially important if you have small children; your cat needs to know it can escape from the too much touching or tugs on the tail when it wants to. Place warm beds, soft pillows or even cardboard boxes in low-traffic areas to give your feline the privacy it craves. Most cats are adverse to being grabbed and picked up off the ground. For this reason, always bend down first before lifting your cat into the air. If a cat can see you before you pick it up, it is less likely to be frightened and more likely to accept those kisses and snuggles from you. The feline species tends to hate change. Whether it be a dietary switch, moving to a new home or the introduction of another pet or person into the household, cats will not like this perceived threat to their little world. To help ease your cat into a new situation, make the changes slowly to help minimize the stress. New pets should be kept separate and introduced to your resident feline safely and supervised over a period-of-time (some can take up to a month to readjust). If you are switching up food brands or litter choices introduce these products slowly by mixing the new in with the old. Moving? Don’t just open the cat carrier to your new home and expect your cat is feel at ease. Keep her in one room with the items that are familiar to her, then let her proceed about the home on her own time table and terms. It’s human nature to want to discipline an unwanted behavior in our pet; however, when cats are yelled at or actioned with other aggressive means (striking a cat will only make matters worse and spraying with water can create mistrust) they most often will just run away and hide until the coast is clear. 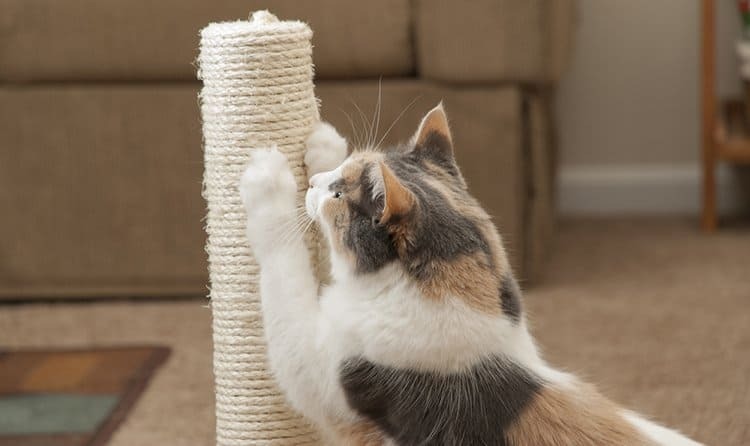 If your cat is scratching your furniture or getting into something it shouldn’t be, simply redirect its attention to a happy alternative like a scratch post or its favorite toy. Discovering the personality of your cat is another way to ensure you are giving her what she needs and desires. To do this observe her at play and how she interacts with you in a relaxed atmosphere. Soon you will know exactly what she likes and totally despises, which in turn will allow you the opportunity to be perceived as someone your feline can trust, and yes, even love! Socializing your kitten early on is very important for its mental development and to help her gain exposure to the different situations she will encounter in life. This includes handling her gently and appropriately, exposing her to the cat carrier and car rides, as well as grooming and nail trimming. A well-socialized kitty will love your attention! Cats can be masters at communication, you just need to know what they’re saying. Be mindful if your cat is trying to tell you to “back off” (flattened ears, dilated pupils, hissing and growling) or if he’s ready for some petting. If you respect his mood and space when he’s not wanting attention, then he’ll be more likely to seek you out when he does. In addition, watch how your cat responds to the different ways you pet him. Is he sensitive about certain areas? Then don’t force those affectionate-misplaced-strokes on him when you know it just makes him edgy. We may feel awful when we keep our cats indoors, but the great outdoors is fraught with dangers for our feline friends. This can include vehicular hazards, being attacked by other animals, run-ins with unfriendly people and consuming things that are poisonous. By protecting your pet from these and other dangers your fur-baby will feel safe and secure and will want to show you its appreciation. Feeding your cat a well-balanced, high quality kibble will not only keep her healthy, but will give her the energy and stamina she needs to interact with you. Foods filled with meat by-products, grains and meals are unhealthy for a carnivorous animal and will have her gaining unwanted weight, which can lead to various health problems and laziness. The way to a man’s heart is not only through his stomach, but it applies to cats, as well. Cat-tasty treats are a wonderful way to lure a reluctant kitty out from hiding, to give as a reward after grooming or a nice way to gain trust and bond as human and pet. Have you ever gone into a gas station bathroom? It’s disgusting, right? Cats are very clean by nature, so imagine your cat’s horror each time it enters an unkempt litter box. Clumping litters on the market today do a great job of sopping up urine and covering up feces, just be sure to stoop-n-scoop on a daily basis (or more). It’s also good practice to completely remove all the litter once-a-month and scrub out the litter box with dish detergent or a mild all-purpose cleaner. Another important tip when it comes to Kitty’s bathroom is location, location, location. Cats desire privacy when they eliminate so place her litter box in a separate room or low-traffic area. She is sure to love you even more each time she needs to relieve herself. One of the best ways to bond with your feline is to engage in play with him. Use laser pointers, toys on wands or toys made with catnip that enable you to toss and throw them for your fur baby. Your cat will enjoy the challenge of “the hunt” and will view you as more than just someone who fills the food and water dishes. 17. Scratch Posts Are a Must! All cats need the luxury of having a scratch post (the taller the better). By nature these animals are inclined to reach up and scratch a rough surface, which provides them with an emotional outlet, as well as a way to leave their scent behind. By providing your furry pal with an appropriate post, he can use his claws in a safe and healthy manner and also get up high to survey his home. Your cat will love to look down on you from up above and will appreciate your loving gesture. Cats are meant to have claws. This is a fact that we as humans must understand and must be willing to allow. Many folks are under the impression that declawing a cat is a simple process that involves just popping out the claw. This is a gross understatement! Declawing involves the amputation of the first digit of the cat’s toe. It is a painful process that can oftentimes lead to excessive biting, joint problems and back issues. For your cat’s sake, please keep those claws! You may find yourself with a cat that is just plain scared of everything. What can you do? You’ve tried being patient and loving, but nothing seems to work. For these cases, experts recommend using a pheromone diffuser. These infuse the air with a special scent that has been proven by various studies (Veterinary Record and Applied Animal Behaviour Science) to calm the nerves of a stress-out feline. The special Ceva Animal Health’s Feliway pheromone sprays and diffusers can also reduce stress-related behaviors such as urine marking and aggression. Cats that feel more at ease will be more apt to want to love and interact with its pet parent. According to Cat Behavior Associates, an adult cat needs to see a veterinarian on a yearly basis (unless there are chronic health issues). Annual checkups will help keep your cat safe from disease, parasites and also a way to have an overall physical to catch an underlying problem before it gets worse. A healthy cat is one that is eager to show you love and companionship. Of course, what good are all the previous tips without a lot of love? Showing affection to our cat is probably the best way to ensure that it feels safe and comfortable enough to reciprocate the emotion. Love your cat and be the best parent possible. Before you know it your feline friend is sure to respond back with a warm cuddle, a slow-blink kitty-kiss or a soft bunt on your forehead. We may not ever get love-on-demand from a cat like we do from our canine companions, but that doesn’t mean he or she doesn’t care for us on a deep emotional level. Follow these tips and give your cat an extra dose of kindness, respect and understanding each day to help garner a closer bond between you and your precious fur baby. My 4 y old kitty has had diarrhea for 3 days and goes where she wants to instead of the litter box (she uses it sometimes) I do keep the litter box clean! She has an appetite. Should I take her to the vet? If the diarrhea is not better already I would definitely take her to the vet. very nice. my cat is feraland mean,. this may help. I will buy some cat treats today. thanks. My cat is one of my best friends. Thank you for this awesome guide, I can sure that she will love me more in future. Great tips. And taking more time with our cats is essential to promote the relations.